The return of the Benimar name to British shores has been an overwhelming success, both for the brand – whose factory in Peñíscola, Spain had some spare capacity available – and for dealer giant Marquis Leisure, which has an exclusive deal to distribute the range in the UK. Hugely positive reaction from customers to the initial five-model Benimar range in 2015 has prompted Marquis to extend the line-up to 10, covering low-profile fixed-bed models and traditional, family-friendly overcabs. You can read our news story about the Benimar Mileo models launched at the NEC Caravan Camping & Motorhome Show in February 2016 here. The Benimar Mileo 286 is a relatively unorthodox layout, with a rear garage, washroom and kitchen plus a transverse drop-down double bed over the central lounge. So far it has been selling better than expected, with buyers appreciating the combination of a bed that doesn’t need to be made up every evening, along with a very impressive lounge, a spacious, well-equipped kitchen and masses of storage – all on a 6.99m body length. 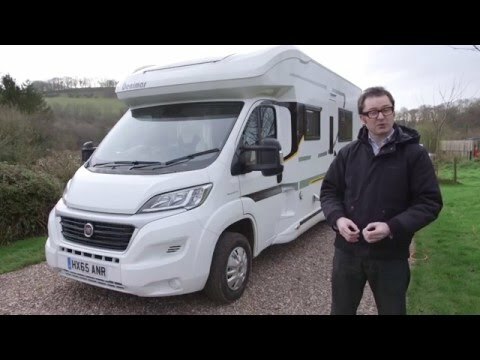 There’s also a huge kit list, from the 150bhp version of its Fiat Ducato base vehicle’s 2.3-litre turbodiesel, to a standard Winter Pack and Truma’s latest iNet remote control for the 6kW heating system. The latter should make it ideal for year-round European touring. Unlike most imported ’vans, the Benimar is UK-specific with its habitation door on the nearside and, like the rest of the range, the 286 is a sharp-looking motorhome. It has a reasonably low profile given that the main bed is stored in the roof space, and the body sits low on the chassis, which makes it easy to get in and out without a step. The yellow/black graphics and the dark- tinted windows look smart, with the upmarket feel completed by the body- coloured bumpers and daytime running lights. Usefully, all of the services – water, fridge vents, toilet-access hatch and the waste-water outlets – are relegated to the offside except, oddly, the heating vent (though that’s a long way forward) and the hook-up point, which is midway along the nearside. That means you’ll have to think about where the cable runs to avoid tripping over it, especially if you have an awning (not part of this ’van’s standard kit). We understand that Marquis service departments have been surprised by how well-built the Benimars are, with very few coming in for repair, and our test ’van certainly felt solid. In smaller versions of the Benimar range – such as the Benimar 231 that we tested in 2015 – the pep of the 150bhp engine seems like something of an extravagance; in larger versions, such as this 286, though, it’s more of a necessity. Despite peak torque arriving at 1500rpm, the 2.3-litre turbodiesel does need to be worked for brisk progress; but stir the six-speed gearbox (a Comfortmatic auto is an option) and it has plenty of punch – at the expense of fuel thirst, of course. After driving on various types of routes, we averaged a fairly respectable 25mpg, although the vehicle was rarely heavily laden. Once up to speed, the Mileo 286 cruises happily at the legal limit and feels more stable in crosswinds than other versions that we have tried, no doubt aided by its sensible overhangs and relatively low height. On the whole – the inevitable lack of rearward visibility aside – this is an unintimidating vehicle to drive, mainly thanks to its being relatively slender, at 2.3m wide. The only time it feels ungainly is in sharper corners, when you can feel the high centre of gravity courtesy of that drop-down bed mounted in the roof. As for the cab itself, apart from the usual slightly awkward driving position, there can be few complaints. The spec level is hugely generous, with automatic lights and wipers, cruise control and steering-wheel controls giving access to impressive multimedia options that include DAB, Bluetooth, sat-nav and a rear camera – ideal for manoeuvring in car parks and on site pitches. The habitation door opens straight onto the enormous lounge. With the front captain’s chairs swivelled, and the infill cushion linking the side sofas with the front- facing belted travel seats, you could just about squeeze eight people into this amazing space. However, introduce the table – a heavy tubular-frame affair that lives in the rear garage when not in use – and that number drops to six, with the cab seats too far a stretch away. There may be plenty of UK-specific features in the new Benimars, but the interior is distinctively Continental: two-tone cream and brown suede- effect ‘Gaho’ upholstery, and dark wood that’s lifted by cream walls and white cabinets – not to mention bright-red cushions. It will divide opinion, but most team members who saw it liked it; doubts were raised over the practicality of the paler fabrics, however. Plenty of natural light from the two side windows and the cab’s panoramic sunroof make up for the lack of an overhead skylight, and at night the lighting options – all of them LED – are seemingly endless. From the attractive blue glow of the floor-level lighting to the spotlights recessed in the base of the drop-down bed, it’s easy to get the lighting to suit your mood. Take a look in that blue-lit area around your feet and you’ll also see plenty of outlets for the uprated Truma Combi 6kW heating system; it certainly warms up very quickly, so the large lounge never feels draughty despite its size. As in all Mileos, the 286’s boiler is iNet ready, so you can tick the option for the iNet box and control your heating remotely via your phone. We already know how the section of the review about the kitchen is going to go, right? It’s a Continental ’van, so the galley will be an afterthought – no worktop, minimal storage and little kit... except that the 286 hasn’t read the script. You’d need to be a picky chef not to be impressed by its long, nearside-rear kitchen. There’s lots of workspace, even when the hob and sink glass lids are raised, and some neat solutions including a drainer that is stored inside the stainless- steel sink. There are a couple of 230V sockets (and one 12V); the dual-fuel hob has two gas burners and one electric hotplate. There’s a combined oven and grill, and even a microwave, sensibly mounted low, beneath the worktop. Overhead, there are four large lockers with rails above giving handy additional storage, plus a well-placed rooflight to evacuate cooking smells. (On our test ’van, an optional Truma air-con unit also helped). The remainder of the storage comes from large drawers, two cupboards and a very natty full-height larder that pulls out from the wall. On the other side of the van, tucked between the rear travel seats and the washroom, is a space- saving tower fridge with a removable freezer compartment and, beneath, a chilled bottle storage drawer that should endear it to bon viveurs. There is no doubt that, for most, the electric drop- down double bed over the lounge will be a big part of the 286’s appeal. At the turn of a key and the touch of a button, it can be lowered to just above the sofa backrests, from which it is accessed by a small ladder, and the occupants are protected by a safety net. This leaves space below for a couple of visitors on a second double, made up from the lounge sofas. There’s a padded headboard and an LED strip-light above for reading. If you’re travelling solo or as a couple, you can move the backrests and drop the bed all the way down to the seat squabs, giving a more familiarly domestic feel. Either way, the slender mattress and minimal springing combine to make for a firm bed base, which won’t be to all tastes. Once you’ve deciphered the cushion jigsaw, aided by a diagram on the inside of the wardrobe door, the make-up lounge bed is huge and comfortable, with the cushions fitting together much better than on some beds of this type. Here are the bed measurements: drop-down double 1.9m x 1.4m (6’2.8” x 4’7.1”), lounge double 2.1m x 1.3m (6’10.7” x 4’3.2”). In keeping with the fit, finish and equipment levels in the rest of the Mileo 286, the washroom impresses on first inspection. There’s a Thetford C260 loo with plumbed-in electric flush, a smart circular sink, and a decent separate circular shower cubicle. The showerhead doesn’t offer the most generous spread of water compared with the more common Ecocamel, but it’s otherwise impressive, ably supported by the Truma boiler. A rooflight and window provide plenty of natural light, while storage is taken care of by a pair of cabinets – one beneath the sink, the other wall-mounted – and the first of two wardrobes, of which more later. It’s not without its problems, however. Bearing in mind what a large and roomy motorhome this is, the washroom offers only limited floorspace for dressing. Our test ’van also suffered from a cold spot here but there may have been an issue with the ducting, because little warm air was making it through the single outlet. Whether you are travelling two- or four-up, you are unlikely to exhaust the storage options in this ’van. Key among them is the large full-width garage, which has three access doors (one from the kitchen). It’s big enough to make the most of the 370kg payload, but if that’s not enough – and you don’t mind exceeding the 3500kg MTPLM – there are upgrades to boost payload to 520kg or even 1080kg. Inside, there are masses of options, with the kitchen in particular boasting a selection of lockers, drawers and shelves. Above the garage you’ll find a pair of wardrobes, one accessed from the kitchen and the second, and smaller, one from the washroom, which makes it ideal for storing towels, linen and the like. Being only half-height they aren’t ideal for hanging ballgowns, but they are plenty big enough, with deep shelves on either side. There are no overhead lockers in the lounge, but you’ll find a couple of deep bed boxes under the sofas, and useful shelves above the cab that are ideal for storing books when the drop-down is at its higher level. Bearing in mind the £50k-plus price tag (though current deals at the time of our test bring it under that barrier), you expect plenty of kit – and the Benimar doesn’t disappoint. Standard equipment is hugely generous – from the luxurious cab with its multimedia options to the well-specified kitchen, which is an unusual sight in a Continental ’van. The Winter Kit adds insulated and heated water tanks, insulated pipes, plus an upgrade to the 6Kw Truma Combi boiler – which is iNet ready should you fancy getting your dealer to fit the optional iNet box so that you can control the heating remotely via a smartphone. There’s an impressive five 230V and three 12V sockets, plus a pair of USB charging points (one in the dash, the other above the cab passenger seat) to cover you for every conceivable device. Practicalities haven’t been forgotten: there’s a spare wheel, space for two gas bottles and impressively generous on-board water tanks, at 127 litres for fresh and 105 litres for waste. On the roof, you’ll find an omnidirectional aerial, and a 140W solar panel. At a whisker over £50,000 (or a whisker under with discounts at the time of our review), the 2016 Benimar Mileo 286 is not cheap, and there are less pricey home-grown options. However, for an import, it represents good value. Its habitation door is on the UK nearside, and there’s the kind of specification with which few can quibble in terms of practicalities – such as higher-output engine and fully kitted kitchen – and luxuries. We doubt that many families will be tempted by this layout, but for a couple who enjoy socialising it is hard to fault, offering plenty of room for a party and the luxury of a made-up bed that drops from the roof when the last stragglers have left. And to see other Benimar motorhomes for sale, click here.